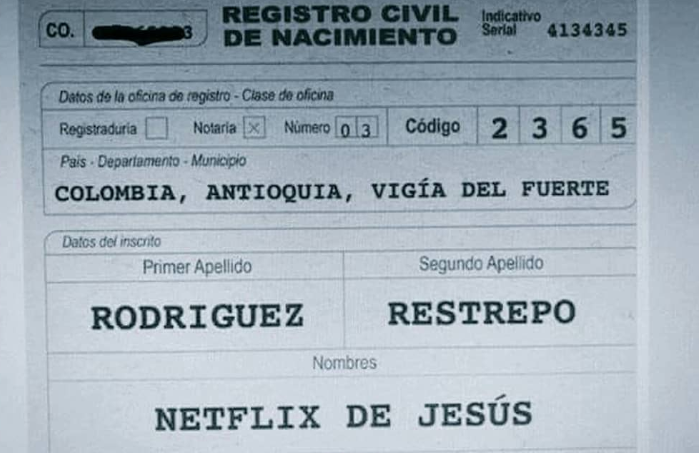 Did a baby named Netflix de Jesús get registered this year in Colombia? This is not entirely an implausible claim, but it does sound just a liiiiittle bit too good to be true, and the first page of google hits (example, example, example, example) seems to be mid-range news outlets that are just riding on the (then-viral) image from social media. Did this in fact happen? Or is it indeed too good to be true? Browse other questions tagged social-media colombia . What role did Facebook/Twitter play in the “Arab Spring”? Did the Twitter account Fifndhs predict the exact World Cup results ahead of time? Did this Twitter bot predict the Paris shootings 2 days before they happened? Do 82% of women making $100K per year in the US do it through home based businesses? Is this picture from the flooded cave rescue in Thailand? Did GOP senators say these things about Kavanaugh allegations?